Greenhouse seedlings, transplants are ready six to eight weeks early and you can grow Out-of-Season Treats in winter! Pest and disease free equals greater production! For institutions like hospitals, greenhouses are workhorses! A greenhouse is a most valuable part of a productive home garden. Seedlings are ready for earlier planting. Hospitals want the best food possible for the health of their patients, and can’t afford to be weather dependent. As a home gardener in coastal SoCal areas you may question the need for a greenhouse. Though unheated, ours at our mile-from-the-beach community garden is well used! We often run out of space for everyone’s seedlings as we get closer to planting time or the weather warms! Even unheated, an enclosed space is heated by the sun during the day and doesn’t get so cold at night, no chilling winds or late freezes in there! Seedlings are protected from marauding pests, birds, walkabout creatures. Foothills and inland gardeners get more heat and more COLD! They really can use greenhouses to advantage. In addition to starting preseason transplants, in a heated greenhouse you can grow out of season tomatoes, peppers, lettuces, cucumbers, beans, eggplant, zucchini, cantaloupe! Herbs, chard, raspberries and strawberries! And winter crops too if you just have too much snow outside! Your greenhouse doesn’t need to be huge or showy. It just needs to do the job. Our land is flat, but yours might have slopes and you could choose to have an earth shelter space complete with indoor shower! See also Heating Greenhouses Without Electricity! Greenhouses come in a vast variety of shapes from squares to pillowdomes! Buy a premade kit or design and build it yourself entirely to your specs. You can have a 2′ wide up against the chimney mini to a palatial entire rooftop greenhouse with an elegant view! You may have a built in the ground greenhouse cousin, a cold frame, or an indoor kitchen window box. Materials vary from hoop frames to the fanciest filigree and glass, cob or strawbale! They can be spanking new, made of have-arounds, or be recycled from demolition sites! Covering materials can be poly films, panels, glass and glazing. There are so many new products, techniques, new research, all the time, and each person’s needs are so different, it is wise to check these things out for yourself. Talk with several ‘experts’ on each topic. Read up online. Compare. See what you really want. See what will do the best job for your needs. If you have space for a larger greenhouse, consider gardening some of your crops in it! Hoop houses, or high tunnel farming is a recent invention. They are certainly the larger version of traditional row covers! There are huge commercial installations. Yet home made hoop houses can be no bigger than 8X8, so easy to put up a child can do it! Season extension is the #1 advantage. 30 days on the front end and 30 days on the back end of the growing season is equivalent to moving your farming operation 400 miles to the south! Yields increase when your plants are protected from excessive rain and wind. When a more ideal growing temperature is maintained, a reduction in temperature-related stress, fruit set, fruit size increases. There is no bolting, so no loss of your plant’s production. Because temperatures are maintained, you can plant when you want to, not have to wait until conditions are favorable. Soil conditions are more controlled, less moist, less to no fungi – wilts, blights. No pests, no pesticides! No birds, small mammals. Energy efficient attached greenhouses make a lot of sense. The home, and these bricks, help heat the greenhouse for free! Some attached greenhouses are beautiful walkin sunrooms, garden rooms, conservatories! If you decide to build a greenhouse yourself, first check on local ordinances and with your neighbors. Place it conveniently, near electrical and water access if possible. Choose a location with a winter angle for maximum light, as much sun as possible. Use trees for windbreaks if necessary. Know your prevailing wind direction, be sure it is well anchored. Use concrete blocks with eye hook attachments, sink posts or anchoring stakes, or use sand, not rocks, on the windward base cover. Your roof choice tells us what kind of weather you have! Steep slopes and insulated lower areas tell us you are in high cold country with snow and need to decrease your heating costs. Medium slopes with rounded shoulders are good in windy and rainy areas. An extended slope on one side that faces the sun tells us you may get a lot of shade from trees on one side. Doors make a difference. If you are in a windy area, you might choose sliding doors that can be secured and weather stripped versus velcroed flaps, zippers or swing out doors that blow away or animals could get through. Ventilation is key! Hot days are hot! In two shakes a greenhouse can to get up to 110 degrees! Doors and windows can be the vents if intruders are not an issue, otherwise, ceiling vents are best. Solar devices can be set to open when temps hit a high level. Fans may be needed. Consider solar lights, vent openers, fans or simply long sloped sides to have lots more solar energy as in the image! Irrigation tips! Put your timer OUTSIDE! Make & see your adjustments without getting wet! Mini drop down sprayers or foggers at varying adjustable heights along an overhead line are fabulous! Consider recycling your water – is it legal to use grey water where you live? Collect rainwater. A word about Damping Off. Damping off is a common problem with seedlings started in containers, indoors or in greenhouses. Per Planet Natural: ‘Several fungi can cause decay of seeds and seedlings including species of rhizoctonia, fusarium and phytophthora. However, species of the soil fungus pythium are most often the culprit. Damping off typically occurs when old seed is planted in cold, wet soil and is further increased’ by poor soil drainage. The super simplest prevention is Cinnamon! Just sprinkle it on the soil! Sprinkle on plant injuries and they will heal. It is a rooting hormone. Mildew, mold, fungal diseases? Mix 4 tablespoons cinnamon in a half gallon warm water, shake it vigorously, steep overnight. Strain through a sieve or coffee filter and put it in a spray bottle. Add ¼ teaspoon liquid dish soap as a surfactant, lightly spritz your plants, undersides and tops of leaves! (In Santa Barbara area buy it in big containers at Smart & Final.) Also, it repels ants! Pathway and Flooring best for your plants and feet! Have a sturdy pathway that stands up to wheelbarrow use. A non muddy pathway saves your greenhouse floor. A raised flooring keeps you from having a muddy mess. Drainage is necessary so there is no rot or mold. Heated flooring is the best. There are great options, more and less expensive! Concrete, rubber matting saves your feet. Dirt, my last choice, and/or pavers. Decomposed granite, pea gravel, raised wooden slats, pallets, straw, chips – use weed mat underneath! Use pest protection wire under weed mat and soft flooring choices. No gophers, no mice, squirrels, bunnies or snakes, thank you. Construct your shelves wire covered like the top shelves in the image, or like the lower shelves, out of spaced boards so water drains, the boards dry, there is no mildew or mold. OR some say don’t have bottom shelves so there is no nesting space for mice or chipmunks – they WILL eat your plants! You want to be able to SEE the ground! Depends on how critter secure your house is. Rather than just the greenhouse, consider a 4 part working complex! A storage shed, the greenhouse, a covered work area and hardening off area. Tool & Gear Storage could hold your tools and supplies! Deal with pests and diseases immediately! Greenhouses made of reused doors and windows are much more green than recycling! Sustainable Greenhouses are often compost or solar heated! They have heated benches and floor because root zone temperatures are more critical to plant growth than leaf temperatures. By maintaining an optimum root zone temperature, greenhouse air temperatures can be lowered 15° F! Soluble components of the plant debris can be incorporated back into the nutrient solutions. 5 Sustainable Sources to stir your thinking! Fresh City Tomatoes, Any Time! On his way home from the office, the computer scientist harvests tomatoes from his company‘s rooftop greenhouse. No food miles! Why not produce lettuce, beans and tomatoes where most of the consumers are to be found: in the city? The flat roofs of many buildings are well-suited for growing vegetables. Rooftop greenhouses can also make use of a building‘s waste heat and cleaned waste water. Solar modules can do the rest. This uptown rooftop greenhouse urban garden is in Germany. Image courtesy of Fraunhofer UMSICHT. Greenhouse Conferences! Tradeshows, sustainable, educational. Local, international! If you love greenhouses, might want to do urban agriculture business, just want to get involved, check these out online. There are different sponsors, different locations each year! Whatever your special connection is, in SoCal, before our winter rains and cooler weather, late summer, early fall are perfect for getting your very own fine greenhouse up and running! If you miss that window, very early in the new year is good so you can start seedlings for early March plantings! You might decide to sleep in it the first night! A wet winter? Dry winter? If you think that might happen, excellent time to establish native plants and ground covers in your landscape, make raised beds in your veggie garden! They don’t have to have a frame, in fact, you can ‘make more space’ by planting on the sloped sides, preventing erosion! The plants that don’t like soggy feet, or would simply drown from too much water, will have excellent drainage. You can make your ‘bed’ as small as a furrowed area, or make it two feet wide. Either way, same result, drainage, less water molds and fungi, keeps oxygen your plants need in the soil. Put a thick layer of pine needles, leaves, straw, something that will feed the soil, in the pathways. That’s sustainable and your shoes won’t get muddy. Re-layer as needed. Powdery Mildew is creeping right along…. Hmph. 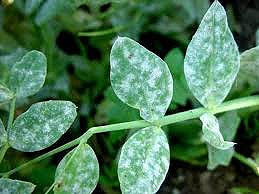 Powdery Mildew is windborne, and UC Davis IPM (Integrated Pest Management) says ‘Powdery mildews generally do not require moist conditions to establish and grow, and normally do well under warm conditions. Good thing it’s getting cooler. Ok. So prevention, prevention, prevention. A general home recipe is baking soda (sodium bicarbonate, 1 Tablespoon to a gallon, ¼ cup nonfat powdered milk, 1 teaspoon cooking oil (canola, soya, whatever), a drop or two of dishwash or soft soap (to disperse the oil and make it stick). Spray or use a watering can whose spout can be turned so the water goes UP under the leaves. Drench your plant, top to bottom so those inner bottom leaves get plenty of chances to get soaked. The drips go into your soil, helping from there as well. Do it on a sunny morning so your plants can dry well during the day. Please! Be a good neighbor. Prevent this common fungus, don’t let it blow into your neighbor’s veggies!